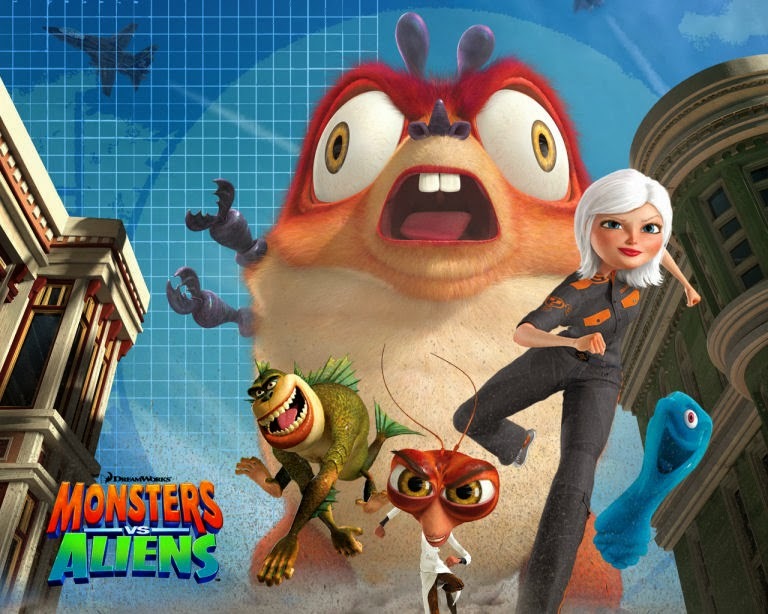 Monsters vs Aliens was largely well-reviewed, made good money – primarily in North America – and ticked most of the boxes for a lighthearted animated comedy. On the other hand, it was one of the most instantly forgettable of the animated features of the first decade of the millennium, and is nobody’s favourite, largely because it does just what it says on the tin – it has monsters fighting aliens in a light-hearted comedy based on B-movie clichés, and for that reason it will likely entertain for the duration, but break no hearts, jerk no tears and lead to no calls for a sequel (though sure, why not a spin-off series?). Because while boxes get ticked, there’s no sense of human connection, and with the point being that the monsters are nice guys all along, you don’t get the same chance at growth and affection in the likes of Despicable Me. I didn’t bother with Monsters vs Aliens at the cinema. At the time, I have to say that I largely ignored DreamWorks animated features. Antz I can hardly remember, the first Shrek I didn’t like, I missed Madagascar and found the trailers annoying, and though I liked the look of Kung-fu Panda, I didn’t see it until 2010, two years after its release and a year after this film. Soon after, of course, there was a bit of a turning-point for DreamWorks with the lovely How to Train Your Dragon, followed by the enjoyable follow-ups Kung-fu Panda 2 and Puss in Boots, then the strange hit-with-edgy-kids-despite-not-quite-being-on-the-wider-cultural-radar that is Rise of the Guardians, and even if The Croods and Turbo have taken DreamWorks back towards the goofy, somewhat superficial side that used to define them, they remain in a good place. But for Monsters vs Aliens, my only contact with it was a random Happy Meal toy my friends and I found at a convention in 2009 and decided was our silly mascot, especially since its inexplicable gimmick function was, upon being wound up, to vibrate and travel slowly, jerkily backwards. We named him Stig after something some random junkie/drunkard passing by said, and Stig he has remained to me until today, when we spotted the film on iPlayer and decided to watch: his real name is Link. The first thing that struck us about the animation here was that the humans are ugly. They are designed very weirdly in the face and their movements are clunky and ungainly, save perhaps for the main character, Susan. Thankfully, this is only a problem for the opening scenes, because Susan is really the only human who has significant screen-time except for the President of the United States – played with rather too much conviction of his own funniness by Steven Colbert – and much of that is in tandem with techniques to make her look huge. For after a meteor containing ‘quantonium’ crushes her on her wedding day, she grows huge, bursting out of a building with more gusto than Alice ever managed in Wonderland, until she is a 50-foot woman. Whisked away to Area 51, she joins the government’s other classified monsters – Link, first names ‘The Missing’, who is a strange amphibian convinced of his own strength but somewhat out of shape now and the most human and approachable of the bunch as essentially an airheaded jock; cackling mad scientist Dr Cockroach, who has merged his DNA with that of the eponymous creepy-crawly, voiced by Hugh Laurie at the height of his House fame; B.O.B. the amorphous blob who lacks a brain but is stretchy and indestructible; and Insectosaurus, a bestial but loyal monstrosity seven times as tall as Susan, who I think was developed when someone joked about what Mothra must have looked like before metamorphosis. The arrival of the aliens is neatly tied to Susan’s developing powers, for their goal is the quantonium that was behind her transformation. When no force in America can answer the threat of the initial robot invasion from the hostile aliens, it’s left to the monsters to save the day, and things start to get fun – and Susan starts to realise that maybe the life she left behind wasn’t as great as she thought it was before this life-changing event. And ultimately, the film is good, but only good. It has some horrible misfires – like the Presiden’t poop joke (‘Brown alert’) and a string of homages to the likes of Close Encounters and E.T. that just feel like someone ticking off boxes on a list – but the humorous quirks of the main cast keeps then funny and likeable, the computer’s thoughts on its countdown got a genuine belly laugh from me and it was quite refreshing to see the reversal of gender stereotypes in the Renée Zellweger cameo scene. Oh, and I loved the kid from the DreamWorks logo getting abducted. There’s good reason for me not to rush to see this. There’s good reason I wouldn’t have been sad to miss it altogether, and looking slightly dated now, I’m sure that in 20 years it will be very seldom-revisited. But if there’s a chance to give it the hour and a half it needs with little to no inconvenience, I wouldn’t hesitate to tell someone to go for it, because while it lacks real emotional punch or any human touch, it also does what it sets out to do well. And sometimes that’s enough. I love animations and didn't know about this one until I came across your blog, yay! I love to snuggle with my children on the couch after dinner and watch films with them and I was horrified when I came to the realization that I may have run out of movies!